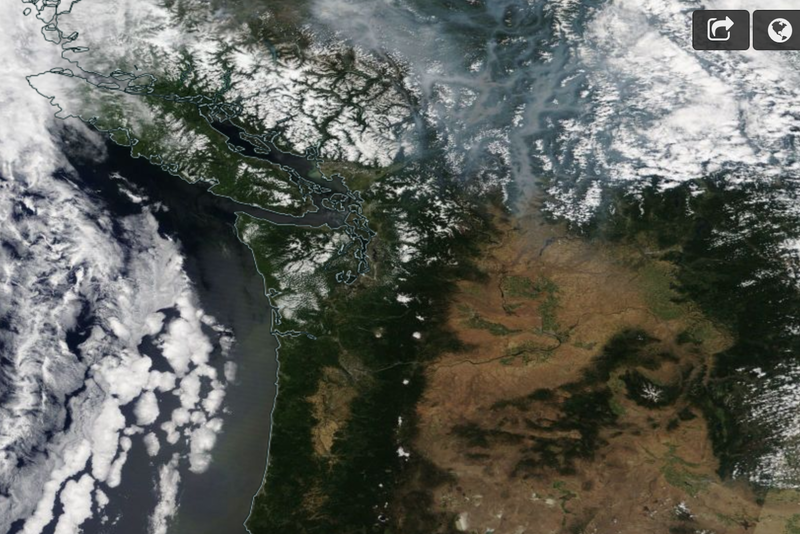 The wildfire and smoke situation is far better over the Northwest this year and there is a good chance it can stay that way for several weeks if we are careful. 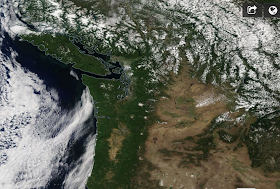 Let's start by comparing the high resolution MODIS satellite imagery for yesterday around noon and the same time one year ago (below). This year, with the exception of some clouds, has clear skies with little hint of smoke. But last year, dense smoke, produced by multiple fires over British Columbia, was evident over that province, with substantial amounts pushing into Washington State. 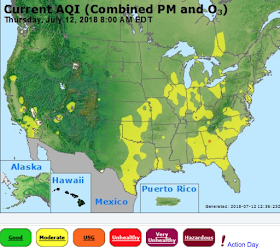 Air quality, as shown on the EPA AirNOW website, is quite good over our region today(see below). Why has this year been better? We started with a healthy snowpack on April 1st, which is good. But the key has been that June had normal to below normal temperatures around the region (see below). And, precipitation, and particularly thunderstorms, were below normal--thus, less lightning initiation of wildfires. 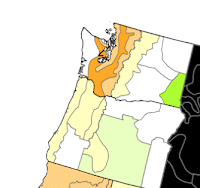 Because of the good snowpack and a relatively temperate spring (except the warm period in May), the soil and fuel moistures are relatively normal right now over fire-prone areas, with the biggest dry anomalies over the western part of the region, which is far more resistant to fires. To show this, here is the current Palmer Drought Severity Index, which integrates past temperature and precipitation to give a measure for the moisture content of surface layer. Not too bad over eastern Oregon and Washington. The forecasts over the next week are favorable. We should be dry, but not excessively warm, with highs getting into the lower to mid 80s over western Washington. The latest ensemble forecasts indicate high pressure building over the West Coast, but of modest amplitude (see forecast height anomaly--difference from normal--at 500 hPa from the GEFS ensemble below). We will be dry....but paradoxically that could be a good thing in the short run, with no thunderstorm and lightning activity over the Washington and much of Oregon. The UW WRF accumulated precipitation for the next week is shown below. Only southern Oregon will get some lightning... and the fire folks need to be ready for that. So what about new fires in the weeks ahead? But we should not forget that fire is entirely natural in our region and much of the problem is created by us. We are pushing our homes deep into the wildland--locations that have burned frequently for millennia. 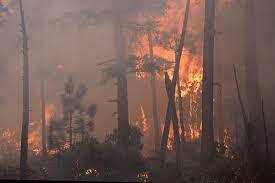 We have mismanaged our forests, including suppression of fires and allowing them to grow into explosive tinderboxes. And we should never endanger young men and women to save isolated homes when wildfires are raging. For too long, many in the media and some politicians have waved the climate change banner when wildfires have occurred, neglecting to push the necessary actions on the ground (e.g., stopping development in remote areas, thinning and burning forests). My field can help immensely by providing forecasts of dangerous situations (like major wind shifts, upcoming lightning events), but in the end some difficult and expensive choices need to be made. Your point about abundant undergrowth providing so much of the necessary fuels for forest fires cannot be overstated. I grew up a Cub and Boy Scout, and we took the Smokey the Bear admonition to heart. Why the Forest Service and Park Service kept to that mantra when all of the evidence pointed to the contrary, I have no idea. The primary "difficult" choice that needs to be made is controlling our human population rationally. We especially need to be careful on the west side, where nearly all wildfires are human caused. Your KBDI graphic indicates significant drought in western Washington, and with the wet spring we had fuels are abundant. As they continue to dry, the only missing component will be wind. While significant wildfires are less common on this side, a little bit of wind can create huge problems, like last year's 500 acre fire near Rochester that destroyed several homes. Oops, I said KBDI, I meant Palmer Drought Index. Amazing how little rain in the late spring can make that much difference. This article suggests were headed for a big fire season this summer? http://mynorthwest.com/1010019/western-washington-wildfire/? I may not agree with you on all your points, Cliff. The wild part of the Cascades- which is most of it- can't and shouldn't be intensively managed by thinning or prescribed burns. I don't believe they do that anyway in a remote wilderness. One thing that can be done is to make houses fire-resistant- when one has a summer cabin in the mountains, they could be brick or concrete, with tile roofs, and no bushes near the house. Unfortunately that kind of construction may be more susceptible to earthquake damage- but in the hills I think fire trumps earthquake on the hazard list. And yes, human population growth is a large part of this problem- and nearly all others. Cedarspring - please keep that misanthropy out of this. We are not in a "significant drought," no matter what the Palmer numbers say. This measure has been thoroughly debunked by Dr. Mass in the past, I suggest you read those posts and respond in the future accordingly. We go through this hysteria every freaking year, no matter how wet or dry the water year was, without fail. We have had some really large fires in North Central Washington in recent years. Usually after one of these large fires, comments are made that the reason for these large fires is due to past mismanagement of the forests allowing excessive undergrowth which is adding fuel for the fires. This is likely true in the forest areas, but many of our recent large fires have burned mainly in the shrub steppe and nearby mixed grass and adjacent lighter forested areas, where this excess undergrowth is either less or not a factor. I think one factor not mentioned that has been fueling these large essentially non-forest fires in this area has been the excessive spring moisture in recent years which has contributed to a heavier than usual growth of grasses. For the past ten years, for example, spring precipitation (March through May) at Wenatchee has averaged more than 50% above the long term normal encouraging lush grass growth. Meanwhile, summer precipitation has averaged below normal during these recent years. 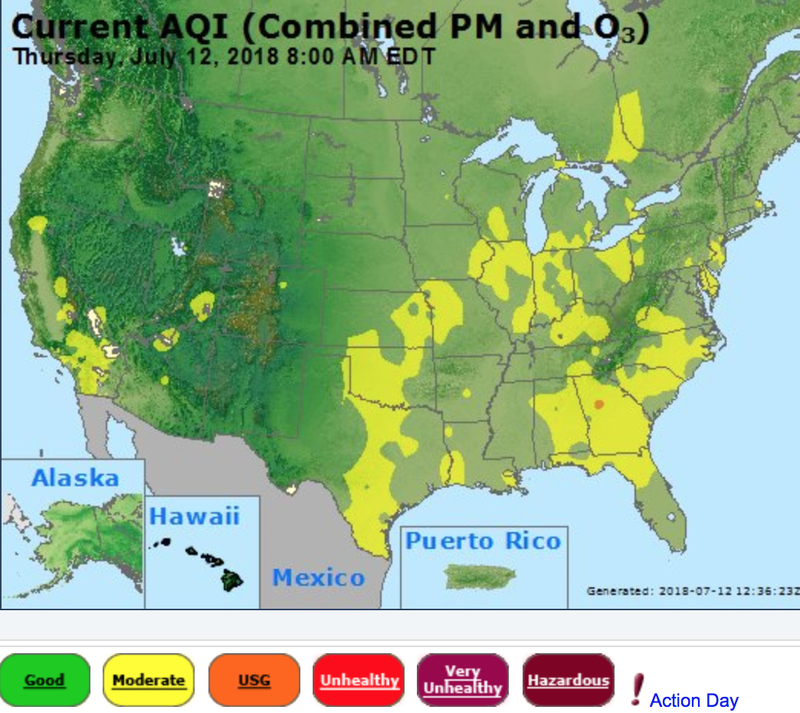 These warm, dry summers following wet springs may be more of a cause of the large fires recently than the mismanaged forest cause stated by other people. @Eric Blair, it's true that the Palmer index is not a good indication of what kind of shape we are in as far as water supply since it doesn't take into account snowpack and reservoir storage. I think it's a fairly good indicator of soil dryness, which directly correlates to live fuel moistures. Dead fuel moistures are at about seasonal average but going down rapidly with the current hot dry weather. From a firefighter's perspective I see more underbrush available to burn. Fires are behaving accordingly on the west side, as evidenced by the brush fire along highway 512 yesterday that escaped the initial response and burned several cars and a house. I just read your article from May of last year regarding your exchange with a climate advocate on The Stranger, where you say that political action in getting people to change their ways is useless, and the only thing that will save us is technology. Yet you're saying here we need to stop building homes in remote areas. That's asking people to change. People want to build their houses in remote areas, so you're asking them not to or advocating for laws that will stop that.